Outside the UK, it might not seem very significant that a handful of MPs have resigned from their political parties to join a new group of “independents”. After all, parliamentary politics in the UK looks so unpredictable and chaotic right now, that eight MPs leaving the opposition Labour Party and three leaving the Conservative Party – out of a total of more than 600 MPs - hardly looks like a political earthquake; nor do they include any big household names. Appearances, though, may be deceptive. Seen in the context of the political upheavals accompanying Brexit, these defections could be the latest sign that UK politics is destined for yet more change. A second referendum is something that both party leaders are also in fact wary of. Leave will have ready made slogan, we told you once, now we are going to tell you again but louder! The political elite are scared by the fact that the public gave the ‘wrong’ answer the first time, what if that happens again? The United Kingdom used to be a byword for political stability, and that is how most Britons – and many others - still like to think of it. Its constitution might not be written down, but its basic principles owe their origins to Magna Carta and have evolved gradually over the centuries since then. There were plots and uprisings, but they failed. There was a Civil War and a Revolution, but also a Restoration. In modern times, no invader has forced his way beyond the Channel Islands; there have been no military coups. After 23 June, 2016, however, that stability – in the political sphere at least - is harder to take for granted. The very pillars of the country’s constitutional system look less reliable. This is happening in three distinct ways. The first concerns Parliament. What we are currently watching is the result of a referendum - direct democracy – confronting parliamentary democracy. The tension between the two is one reason why it is proving so hard for the Prime Minister to secure a majority for the divorce deal she has negotiated with the European Union. The central problem is that, while a majority of voters across the UK voted to leave the EU, a majority of MPs, across all political parties, would – left to themselves – prefer to stay. Do they bow to the “will of the people”, or do they vote according to their own judgement, which is what – in the UK system – they are elected to do? Many are genuinely and profoundly conflicted about where their duty lies. The second concerns nothing less than the unity of the United Kingdom. There has been no change in the UK’s composition since the division of Ireland, which began with the Easter Rising of 1916. In 2014, Scotland considered, and rejected, independence by a 10 per cent margin. The question was regarded as closed. Within two years, however, the EU referendum had reopened it, producing the mixed outcome many had feared. Scotland and Northern Ireland voted by clear majorities to stay in the EU, while England, and by a lesser margin Wales, voted to leave. Now, not only has the question of the Irish border become a major stumbling block to an agreement with Brussels, but the Northern Ireland vote has placed the question of a united Ireland once again on the agenda. With a second referendum on independence for Scotland now in prospect, too, it is not unreasonable to ask whether the ultimate price of Brexit could be the loss of Northern Ireland or even the break-up of the UK. But it is not just parliamentary democracy or the integrity of the UK that is being shaken in the aftermath of the Brexit vote, it could now be – third - also the alignment of party politics. This is the significance of the resignations over the past week. At the time of the UK’s first referendum on EU (Common Market) membership, the political landscape was different. The Conservative Party stood for being pro-Europe, and Labour was the anti-Europe party. This is pretty much when Jeremy Corbyn, now unexpectedly Labour leader and an old-fashioned internationalist, came into national politics. Now, though, both Labour and the Conservatives are divided on the EU. MPs from both parties campaigned on both sides and the result in England showed rural Conservatives and Labour supporters from deprived areas both tending to vote “leave”, while those living in more prosperous and cosmopolitan urban areas from both parties tended to vote “remain”. Attitudes towards the EU ran deeper than traditional party loyalties. ﻿On Tuesday night, Theresa May’s Brexit deal was overwhelmingly rejected by the House of Commons. Mrs May’s crushing loss is the the biggest defeat inflicted on any UK government by parliament. The prime minister is now in a race against time to revamp and revive her deal before Britain’s scheduled departure from the EU on March 29. So long as Europe was just one of many political issues, these inner-party splits were subordinated to other priorities, and party unity could be maintained. But when Europe became THE issue, then everything became a lot more complicated. And it is doubly complicated now, because both the membership of both major parties has shifted to left and right respectively, leaving centrist MPs uncomfortably in the middle. This is not just a question of Brexit. The eight Labour MPs and three Conservatives who have announced their resignations from their parties are all from the political centre, and their disagreements with their party go beyond Europe. Those from Labour regard Corbyn as too far left for their taste, while those from the Conservatives say the party has gone too far to the right, and Theresa May has been too weak to prevent this. Some say many more could resign from their parties - in which case, the new Independent Group, as they call themselves, could grow, and form the nucleus of a new centrist party. This could then be the start of a complete realignment of UK politics, with a Labour Party that is firmly on the left, a Conservative Party more to the right – perhaps absorbing some members of the UK Independent Party – and a centrist party either united with, or separate from, the Liberal Democrats. To some, a more fractured party system might not be a bad thing, enlivening politics and producing more, European-style, coalition governments. To say that, however, may be to run a long way ahead of reality. 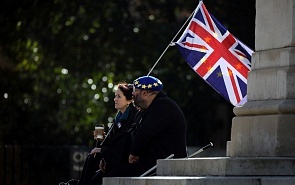 Even in its first few days, the Independent Group has found it hard to present a united platform beyond being centrist and generally pro-EU, and the first-past-the-post voting system makes it hard for new parties to win parliamentary seats. The precedent of the SDP serves as a warning. Founded in 1981 by Labour luminaries, including David Owen and Shirley Williams, it survived only seven years before merging with the Liberal Party - to make the Liberal Democrats. If it has a legacy, it may be to have spawned New Labour under Tony Blair. And yet… While the number of resignations from the two main parties may so far be small, the forces that have given rise to the Independent Group may be stronger and more enduring than those that led to the creation of the SDP. This is partly because the general political climate is one of disenchantment with the status quo. But it is also because Brexit has exposed an enormous failing of the current party system. The big issue at stake is Brexit. The country was split 52-48 per cent at the referendum and, according to opinion polls, remains almost as evenly split today. But the party system does not reflect this division. At the last election in 2017, it was not possible to vote for a pro- or anti-EU party, as both Labour and the Conservatives were, and remain, divided. This is one reason why the voting in Parliament on the “divorce deal” has been so close and so unpredictable and why Theresa May finds it so difficult to secure a majority. Brexit has shown up the conflicts within UK democracy, as between direct and parliamentary democracy. It has exposed sharp differences in sentiment between the devolved regions that could lead, sooner or later, to the break-up of the UK. And now it is causing the traditional political parties to splinter. If that process accelerates, the alignment of UK party politics as it has existed for the best part of a century, could be approaching its end, too. Modern democracy, originating in Western European societies, has had dialectical relationships (i.e., relationships, in which different phenomena, depending on concrete circumstances, have a kind of friend-enemy relationships) with three phenomena that have, on the one hand, supported democracy’s emergence and growth while also putting limits on its expansion and deepening. These three phenomena are nationalism, capitalism and liberalism.